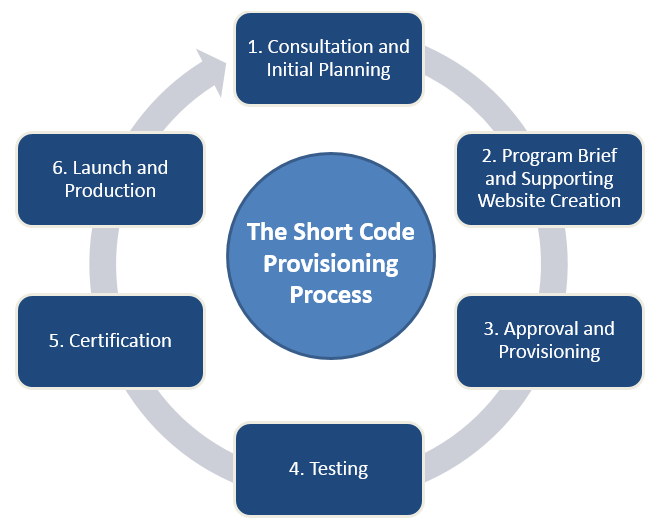 The process of provisioning and certification of a short code encompasses the various stages, or cycles, involved in launching and maintaining a short code service. This outline is meant to provide you with an understanding of the partnership that will be formed between you and the ProTexting team. We’ll work closely together throughout each step of the process, leveraging our many years of experience and expertise, ensuring a quick and hassle‐free launch and continuation of your campaign. This chart highlights each step in the process of setting up a short code; from the initial program idea to live service and beyond. The lifecycle begins with the Consultation and Contract Phase. Work will then commence on the Program Brief phase. Finally, the Approval and Provisioning, Testing, and Certification cycles must be completed before your service can officially operate under your new dedicated short code.